A review of a barely disguised praise of a shrewd dominant woman in popular swords & sandals cinema of the 60s. In the opening scene of Nel Segno Di Roma, Queen Zenobia of Palmyra (Anita Ekberg) is sitting on her throne while the commander of the Roman armies is brought to her limping pathetically. The Roman army is defeated and he has just been captured. A guard: ‘Here is Markus Valerius, commander of the Roman army, alive and at your feet, as you requested, Oh Queen’. She smiles. Not exactly friendly and welcoming. ‘Kneel down’. The Queen is anything but compassionate. She smiles. Not exactly friendly and welcoming. ‘Kneel down’. ‘Not in front of a treacherous Queen, no’ answers the Roman quite futilely now that he is on his knees, nevertheless. The Queen waves the guards away, comes down and stands proudly in front of him, sneering (again). Valerius: ‘To a defeated enemy you give death, kill me, then’. (He obviously feels he has to act macho, but doesn’t seem that much convinced himself anyway). Queen Zenobia, with loads of sneering: ‘No, that would be too much of an honour, slavery is what you deserve!’ (and the way she says it…) ‘It is said Romans pride themselves on being strong, slavery will develop your muscles’. Yes, kind of vexatious for a Roman too. Now, this is talking like a Queen! and you will appreciate the feminine touch, ridiculing him because of his physical condition, pretty unfair considering he’s just had a full day – what with fighting a battle, losing it, being made prisoner and forced to walk in the desert attached and dragged behind a horse to end up being paraded all through town under the jeers of the crowd. Crowds are like that with defeated enemies. Mean! Next scene: close up on chained ankles and naked feet in the dust. As the camera angle widens, you see the ex-Roman consul, now a slave, chained to a big mill with a pack of slaves, struggling to make it turn under the ferocious lashes of the ferocious guards. Now this is puzzling, have you noticed the number of mills in those days? Whenever a guy is enslaved, and if he doesn’t happen to be in Egypt and there is no Pyramid to build, he almost certainly ends up chained to a mill. When it’s not to the oars of a galley. But that kind of covers it, as if there were no other mundane tasks for slaves in antiquity. What about the laundry, mopping the floor, shining the silver, opening oysters, washing the dishes or feeding the cat? As usual, an exhausted slave passing by trips over something and falls under the huge wheel of the mill (standard stuff, 3.5 tons stone slab): one arm crushed. A guard prepares to dispose of him because you know: “cripple slave = useless slave”, but the Roman jumps at the guard’s throat and so on, ensues the usual heroic struggle… (Incidentally it shows that in these cruel ages ex-Roman consuls were genuinely concerned with the wellbeing of slaves. At least when said ex-Roman consuls happened to have been recently enslaved themselves). The slave is saved, but the Roman consul is left in the care of the guard he assaulted. He ends up attached to a cross, baking in the sun. When he has withered considerably after a whole day of baking, guess who comes visiting, impromptu? Yes, Queen Zenobia herself. The statuesque blonde, cool, collected, absolutely charming with a gold tiara and earrings in a black minidress embroidered with gold, is riding in the middle of the slave camp obviously enjoying her daily inspection of the thousands of miserable slaves. The guards savagely whip the cringing slaves to make way for the Queen. Invigorating sight for a young modern Queen. (I know this is taking place in the 4th century A.D. but she was a modern Queen then). Of course she immediately spots the dehydrated Roman on his crossbeams. She has him unfastened from the cross and brought to her. Notice that it would only take her seconds to make the twenty paces separating her from him on her horse but no, instead she orders imperiously: ‘Bring him over’. Queens are like that. Sitting majestically on her mount, she obviously enjoys the sight of the dejected slave being brought to her by the guards. They have a little chat but the miserable wretch is being insolent again. ‘Put him back on the cross’ orders the Queen. Understand now why she had him brought to her? If she had gone to speak to him on the cross instead, all she might have said to show her displeasure at his insolence would have been a “leave him on the cross”, not quite so impressive really. While instead now she could meanly order her guards to attach him back to the cross again. Ha! Didn’t I tell you she was a real nice Queen? She had it. She had styles. Now, what a promising start you might say. Both for the movie and for the reign of this charming young monarch. Nay! Roman senate votes credits, huge task force of aircraft carriers sails for the Middle East to crush Assyria and make a grab at the oil fields… No, wait, I’ve got it all mixed up. But first let’s give it all some context. Queen Zenobia is not the usual young Queen from antiquity with all the bling bling and the heavy make up trying to seduce the most powerful Roman of the moment to save her country, she’s not some common Cleopatra. At a young age she decided to size power, and beat the crap out of Romans to carve out a nice little empire for herself, from Anatolia to Egypt. Romans usually didn’t like that kind of effrontery. Queen is made prisoner. (Yet the impetuous young lady manages to throw a spear right in the chest of the Roman ex-consul ex-slave. (And he had it coming. Their relations had got much cosier. She had elevated him from the rank of slave to that of personal favourite, military adviser and even commander of her personal guard. And all the while the devious weasel had been double-crossing her. You know, politicians… no morality, no gratitude). The spear doesn’t kill him, But he remains in intensive care for quite a while and miraculously recovers. Now, this is interesting: you would expect to find sweet Zenobia chained, humiliated, rotting in some dark dungeon at the very least. But no, instead she is only under house arrest in her palace, raving mad with resentment and breaking precious vases one after the other – because this is usually what spoilt queens tended to do in those days whenever they were upset. Meanwhile the two Romans, (the ex-consul ex-slave ex-adviser ex-favourite, and the commander of the task force just arrived from Rome) are at a loss to console her. 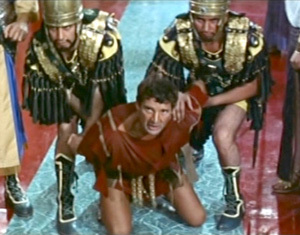 This is true gallantry: when the Roman guy loses: enslaved, chained to the mill, tortured. But when she loses, she gets irritated and plants a spear in his chest and he is apologetic, not knowing what to do to make her forgive him. Well eventually she has to go to Rome for a hearing at the senate, but it all goes well because they all plead for her and swear under oath that she is really a good girl at heart, and yes she might have waged war against Rome for years and conquered all the Eastern part of the Empire but one shouldn’t see any malice in it, it’s just the impetuosity of youth… So she is cleared of all charges. Only the Romans choose another queen to succeed her, a nice modest young girl, ex-vestal of Palmyra but secretly a christian. Yeah right, politics. Some people would stop at nothing to get to the top. And that girl she used to be acting so modest and humble all through the movie! And what happens to Zenobia? Last time we see her she is in the gardens of her Roman villa, smiling sweetly at her husband who’s stepping down from his sport chariot, just back from work. Guess who? Ok, conventional and disappointing ending. But maybe not so much. There are remarkable points in that swords & sandals movie (which I warmly recommend).